Gazing over the latest screens for React! Games' Archon Classic for the iPhone takes me right back to the early 80's. For those of you who may have missed out, Archon is a classic board game from developer Free Fall Associates that takes chess and adds an element of arcade combat, creating what could almost be said to be an action real-time strategy game. React! Games has been working diligently on creating a new version of the title for the iPhone, and if the latest screenshots are any indication, it's coming along quite nicely. React! founder Chad Lee dropped us a line to update us on the progress of Archon Classic. 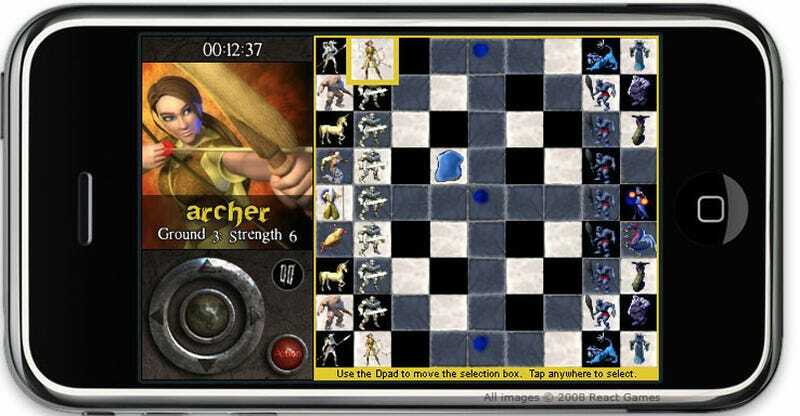 Right now the game features a single-player mode that utilizes a virtual direction pad for control during battle sequences, with the option of using the iPhone's accelerometer to control combat. They've developed a bit of AI they call "Smart Aim" in order to help the players find their marks, explaining that it's "really hard to get a fast twitch response on the iPhone". The screen also zooms in and out during combat based on the distance between combatants, which should add a nice dynamic feel to the battles. The first version of the game will feature the classic game with several difficulty levels. Future updates will introduce multiplayer, achievements, and stat recording. We are very excited about this game...it's not a simple port from another platform, but a game made specifically for the iPhone, taking advantage of it as a console. This game really plays a lot bigger and better than most other games on the iPhone and will definitely be a favorite of everyone who actually play it. Chad also wanted to let everyone know that they'll be organizing giveaways at the game's official website leading up to release, with t-shirts, posters and even custom skinned, limited edition iPod touches up for grabs for those registered in the forums. As for when the game releases, all we know now is that they're very close. Check out the latest screenshots below.